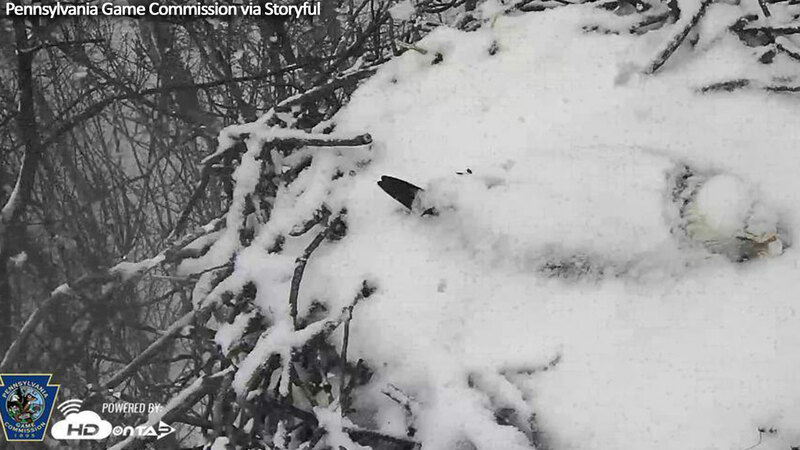 A bald eagle in Hanover, Pa. sits on its eggs to protect them from snow and freezing temperatures. Hanover, Pa. (WPVI) -- Just like us, animals have to handle the cold temperatures and snow. An image of a bald eagle protecting its eggs in Hanover, Pa. has caught the attention of the Pennsylvania Game Commission. Bald eagles develop a brood patch when breeding. It is an area without feathers that contains numerous blood vessels, which allows eagles to easily transfer heat from themselves to the eggs. Female bald eagles have larger brood patches than males, which implies that females do a larger portion of the incubation and brooding. The Pennsylvania Game Commission stated, "It's amazing to watch these eagles incubate eggs during snowstorms."